Looks great XD. Eager to make some FALs and revolvers now. I can't wait to craft them all. Just a question: what are Refined Machine Parts used for? Edited by Lana Woo, 18 December 2017 - 06:29 AM. There is an issue with the Zmas Mount, the Zmas Tree and the Znowman. Despite having the required components, the "Build Now" button cannot be clicked. Another thing, I scavenged a level 37 Event Premium Ice Axe but it disappeared from my inventory when I reloaded the game. You may want to look into that as well. Edited by morsmagnes3, 18 December 2017 - 06:23 AM. Awesome, thanks mors. They should both be fixed after a refresh. Nothing at the moment Lana, but they'll be the new higher quality parts for any future weapons / gear around that level. Con can you please add the x10 Bomb Schematic? Crafting those event bombs 1 by 1 will kill all the time and x10 bomb in 1 craft will be great. Also please add the x10 Crafting Kits Schematics because we all need tons of crafting kits and crafting them 1 by 1 also wastes lots of time. I bet everyone want these x10 bomb and crafting kit schematics. Auto revolver: 16 range? 16 RANGE ONLY. I mean like, it's near useless. Could it be at least like, 18 or maybe 20? 16 range at lvl 55 is very low. FAL: 24 range is nice but...........it's not really much to kill survivors. Most raid guns at lvl 55 will have over 30 range (and they aren't even unique) making this fal pitiful, especially since it has a survivor counter. Could this be altered? maybe make it an infected counter? it's not exactly a proper PvP gun. Either keep the counter and increase range, or change the counter. The Fal is also lacking in dps compared to the other gun, but oh well, it's still not bad. Event Melees: Idk where to start......they aren't great..........nothing special, nothing new. Arctic backpack: um.........again.......why? they seem useless. CQB armor can give you 20% scav speed easily with resistances and 5% luck. 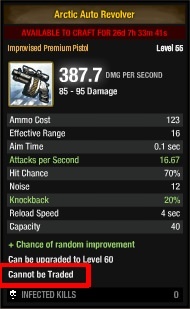 With a 25% craft, this backpack still lacks. Other than that. LOVE THE EVENT. I don't want my criticisms here to make it sound like I don't. I really do love the new stuff. Looks really great. Snow bombs and bauble bombs can be traded, though. Edited by Lana Woo, 18 December 2017 - 04:36 PM. I find the beginning of this event quite disapointing, the craftable items seem worthless, I don't see any buyable cloth, there's no discount for the DMU and now the Z-mas zombies can freeze your survivors preventing them from shooting or running or anything else until the zombies kill them. I'll wait and see if anything changes with the craftable stuff and the bug fixes, mostly for a buff on the backpacks. Edited by Dovahkick, 18 December 2017 - 08:00 PM. I have a proof to show that the new backpacks are ridiculously underpowered. Unique backpacks have bigger scavenge speed, have somewhat equal quality item percentage, have health, have melee protection and injury protection. The Whiteout backpacks have 6 times less scavenge speed than the unique backpack shown, does not have the defensive abilities a normal backpack would have and they cannot be traded. And I bet that a common backpack would be much better than the Big White Backpack. There's no point in crafting such a thing. Edited by Dovahkick, 19 December 2017 - 01:07 AM. Wait they are lootable ? Normally, when the infected santa from the Z mas event explodes, he knocks my survivors down, like a grenade. I've had two occasions where my survivors were completely frozen in the stun animation though, and could not be moved at all. At that point, either the zombies incapacitated them or I had to leave them behind since I couldn't move them back to the safe zone. I highly doubt that it's a bug, I once again got struck by Z-mas zombies and this time my survivors didn't freeze like the first time it did. But this bug, when it happens to you, it's a single snap that ends into a punch in the gut. It's a bug. It's the same bug that paralyzes your survivors when you activate a HERc mine in the Island. Edited by Lana Woo, 20 December 2017 - 12:01 AM. I like it! Really like the exploding Santa's but I am surprised you have never had Fruitcake mines in the Zmas things. Those things would be deadly.